Zeinab (R), a teacher from Damascus, Syria, is seeking asylum with 11 of her relatives including 8 children. Like many Syrians seeking asylum, they are caught in limbo and rely on aid agencies for food and shelter. Sixty-six percent (66%) of Canadian respondents say our government should do more to help refugees fleeing war or persecution. Younger Canadians are much more likely to think that their government should do more to help refugees (76% agree). This is the arresting result of an international survey, the Canadian portion of which was conducted from March 7 to 24, 2016, only days after the Government of Canada met its objective to welcome 25,000 Syrian refugees between November 2015 and the end of February 2016. The survey was carried out by internationally renowned strategy consultancy GlobeScan and polled more than 27,000 people in 27 countries. There are over 60 million forcibly displaced people in the world today. Approximately 20 million of these are refugees. The United Nations Refugee Agency estimates that among this population, at least 1 million people are especially vulnerable refugees who are in urgent need of resettlement. Yet historically, the international resettlement program has placed only 100,000 refugees per year. 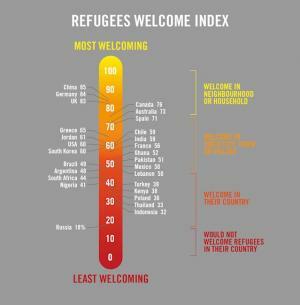 Eighty-six percent of refugees are hosted in the world’s poorer countries. Canada hosts about 4 refugees per thousand population, while Lebanon hosts over 200 refugees per thousand population. One in every 4 or 5 people in Lebanon is a refugee. To respond to the global refugee crisis, Amnesty International is calling on governments to resettle 1.2 million refugees by the end of 2017. That is far more than the 100,000 per year governments are currently taking annually, but not even one tenth of the 20.2 million refugees in the world today. Phase in increases in the number of refugees resettled annually through government and private sponsorship. What is Amnesty International doing about the refugee crisis? The special circumstances and needs of particular asylum-seekers must be taken into account, including victims of trauma or torture, children, women, older people, and asylum-seekers with disabilities. “On the edge of Europe, refugees are trapped with no light at the end of the tunnel. A setup that is so flawed, rushed and ill-prepared is ripe for mistakes, trampling the rights and well-being of some of the most vulnerable people,” said Gauri van Gulik, Deputy Director for Europe at Amnesty International. In addition, Amnesty International continues to equip activists and the general public with the information they need to urge their governments to meet the highest standards of refugee protection. The Refugees Welcome Here! campaign of Amnesty International Canada and the Canadian Council for Refugees recently completed a tour of three Atlantic cities: Halifax, St. John’s and Charlottetown. Campaign staff were able to provide training and materials on refugee rights to over 280 Canadians. Amnesty International Canada is confident that Canadians will support a fulsome contribution and a strong stance by their government. Canadians from coast to coast to coast are invited to pledge their support for refugees here, and to celebrate the contributions of refugees ... and Canada’s part in protecting and welcoming them on World Refugee Day, Monday, June 20, 2016. Amnesty International members are already engaged in planning events in St. John's, Halifax, Montreal, Ottawa and Toronto. Be sure to join Amnesty leaders and refugee-supporting agencies in promoting and participating in World Refugee Day events in your community!